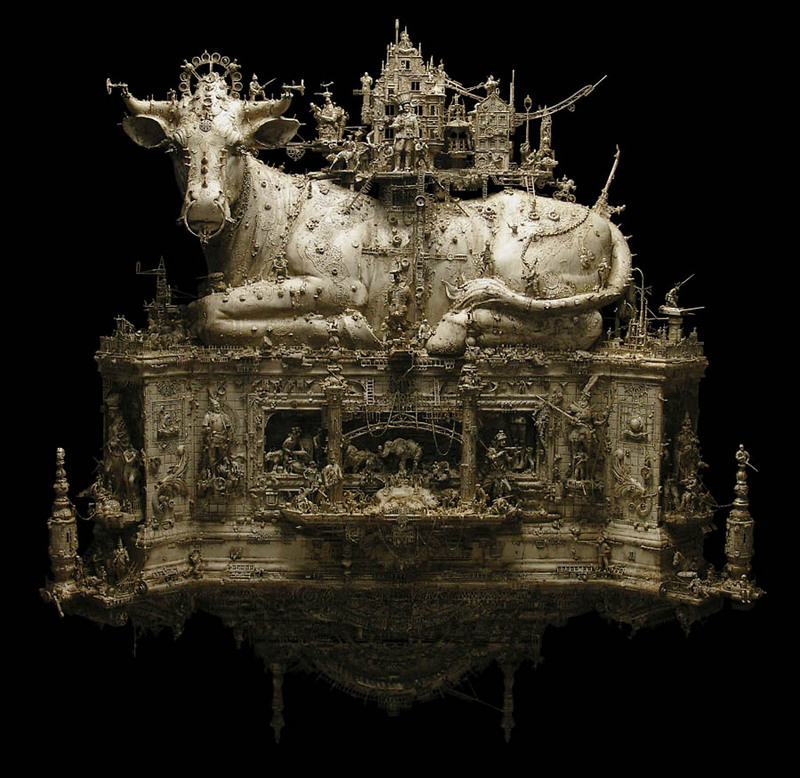 Artist Kris Kuksi had a difficult and solitary childhood growing up in Kansas, leaving him to keep to himself and his active imagination. Fascinated with the grotesque and macabre from a young age, it’s no wonder that his sculptures are elaborate intricately detailed mixed-media works depicting the historical rise and fall of civilization, with tortured Gods and soldiers along with millions of other things going on in every nook and cranny. There’s a hellish quality to them, reminiscent of Bosch’s Garden of Earthly Delights. Each sculpture embodies the trademarks of his philosophy and practice, while serving as a testament to the multifaceted nature of perception – From timeless iconic references of Gods and Goddess, to challenging ideas of organized religion and morality, to the struggle to understand, and bend, the limits of mortality. 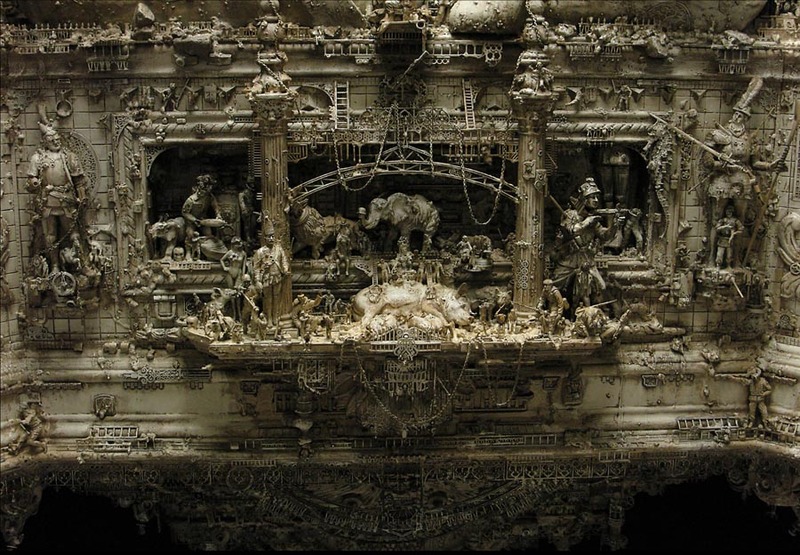 None is complete without a final and brilliant touch of satire and rebuke all conceived in the aesthetic essence of the Baroque fused with the modern day industrial world. In personal reflection, Kris feels that in the world today much of mankind is oftentimes frivolous and fragile, being driven primarily by greed and materialism. Dharma Bovine; Dharma Bovine detail; Auto-Cephalic Supplicating Vehicle; A Heroic Abduction; two details of A Heroic Abduction; Church vs. State; below Church vs. State detail Map of the US with a line drawn through the top 11 most religious cities submersed in resin for water effect. Oil from both tanks spill into the mix; Churchtank Type 8; Church vs. State. There are so many more of these sculptures, as well as paintings and drawings, on Kuksi’s website and facebook page. Definitely check them out. This entry was posted in Art, Just Plain Cool. Bookmark the permalink.